Kakteen Sukk. (Dresden) 14(1–4): 59 (1979 publ. 1980) "macrocanthus " "macroacanthus "
This plant is recognizable for the pale green stem with 12 to 14 ribs and a very few (usually 3) strong and long spines of which one central ; flowers are large , pale yellow. Origin and Habitat: Parodia sellowii var. macracantha is native to Uruguay. Habitat: This cactus grows on rocky outcrops in grasslands or pampas. 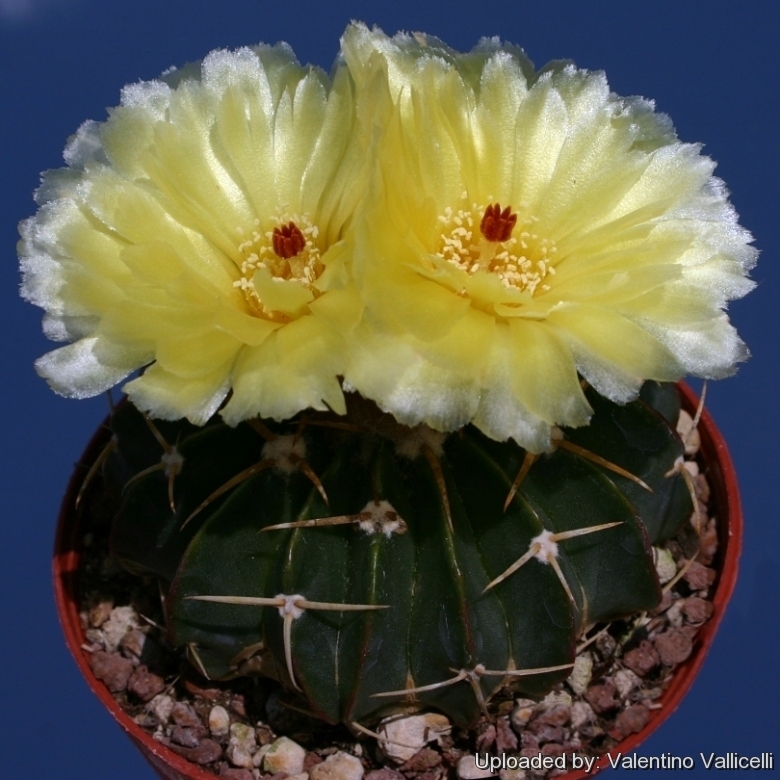 Description: Parodia sellowii var. macracantha best known as: Wigginsia macracantha is the Colombian form of the wide ranging and very variable Parodia sellowii. It distinguishes by having somewhat stouter spines and larger flowers. The differences with other Parodia sellowii are in reality very minimal and most botanist agree on the fact that it should be included in the Parodia sellowii, and the two plants are not readily distinguishable, if not for the fruit colour. 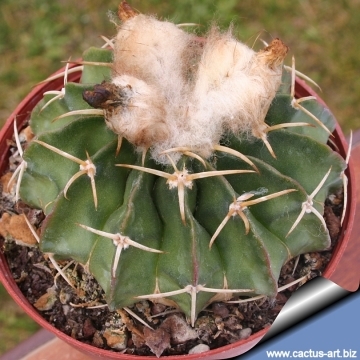 This species is a low growing cactus about 15 cm diameter starting out spiny then becoming more woolly. The stems are flattened globular and will bear several glossy yellow flowers around the very woolly stem apex in mid summer. Stem: Bright or dark green, globose to short cylindrical up to 20 cm tall, 15 cm in diameter. The apex is depressed and filled with whitish-grey wool. Ribs: About 12 to 14 at maturity well marked and sharp whit scarcely prominent chinned tubercles. The crest of the ribs typically take a purple red colour in full sun. Flowers: Large, lemon yellow with glossy petals to about 5 cm in diameter and stand near the top, decorated with about 8 to 10 red pistil lobes which emphasize the yellow of the petals. The buds are tomentose. Fruits: Fleshy reddish to purple about 10 mm long. Cultivation and Propagation: Parodia sellowii var. 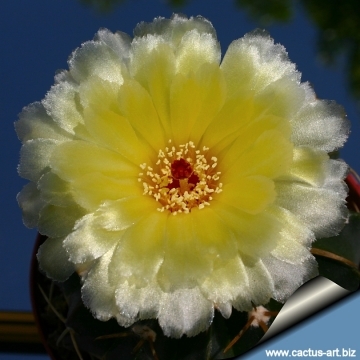 macracantha is an easy to grow tropical cactus that like a warm bright location, but more cold tolerant than most and less fussy regarding soil conditions.